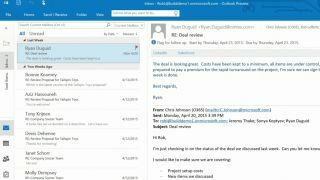 With the new Outlook APIs, third-party developers can now bring their apps and services to Outlook.com through add-ins. Similar to the add-ons that were announced for Office at Build 2015, the Outlook APIs lets developers target the 400 million-strong Outlook.com users, and direct product integration inside Outlook.com helps simplify workflow for consumers. Microsoft announced that it is partnering with Uber, Boomerang and PayPal to help users get more done without having to switch between multiple applications. With the Uber integration, users can schedule their appointments and meetings inside Outlook.com and set an alarm to remind them to schedule a ride with Uber. In a demo on stage at the Build 2015 keynote, Microsoft executives showed that a calendar appointment can be scheduled on the desktop. On the phone, when it's time, the reminder will go off, and users can swipe to schedule a ride with Uber. Once inside the Uber app on the phone, the destination address is automatically filled with the information found inside Outlook.com, so users won't have to manually type this in. This automation helps save time for users as they won't have to switch between the Outlook Calendar app and the Uber app to get the address on their mobile devices. With Boomerang, you'll be able to schedule your emails. "Send messages at the perfect time, get a reminder if your email doesn't receive a response, and add a smart calendar assistant that lets you schedule meetings and share your real-time availability, all without leaving your email," Microsoft said of the service. The company said that it will share more of the PayPal experience later. With the Outlook APIs, developers can target users on Outlook.com, Outlook Web App and Outlook desktop users. Microsoft also showed off integration with LinkedIn and Salesforce apps. With these integrations, the services check the email address fields to show the sender's LinkedIn profile or company name. This is useful for sales managers to maintain relationships and keep up to date with their clients.